Draft: 2011, Florida Marlins, 2nd rd. Adam Michael Conley...married to Kendall and couple has two daughters and an adopted son...following senior season at Olympia High School (WA), in which he set single-season school records in wins (8), innings pitched (63.0), strikeouts (86) and average against (.129), went to Washington State University...set a WSU freshman record with 25 appearances...earned All-Pac-10 honors following sophomore season. Began season with Triple-A New Orleans, before being recalled on May 18; in eight starts for the Baby Cakes, went 2-4 with 5.18 ERA (40.0 ip/23 er)...Worked exclusively as a reliever with Miami, making career-high 52 appearances. Finished with 3-4 record and 4.09 ERA (50.2/23) ...Posted career-best WHIP of 1.09...Entering the year, had made just six career relief appearances, going 1-1 with a 4.35 ERA...Held opponent scoreless in 41 of 52 appearances; in six of the 11 games in which he allowed a run, he allowed two or more...Posted 1-1, 2.13 (25.1/6) marks in 28 appearances at home, with a .157 opponents' average; his 2.13 home ERA ranked 17th among National League relievers (min. 25 GP), while his average against at home ranked fifth...In 24 road games, was 2-3 with 6.04 ERA (25.1/17)...In the first half, was 3-1 with 2.88 ERA (25.0/8); went 0-3 with 5.26 ERA (25.2/15) in 28 games after All-Star break..Held opponents to a .143 average in first half, sixth-best among NL relievers (min. 20 GP)...Went 2-3 with 5.14 ERA (28.0/16) in 27 appearances against NL East opponents; posted 0-0, 1.80 (5.0/1) marks in six games vs. NL Central, and 1-0, 1.46 (12.1/2) in 11 appearances vs. NL West...Earned first career save on July 20 at Tampa Bay; finished the season with three saves in five opportunities. Split seventh professional season between Miami and Triple-A New Orleans, combining on an 11-11 record and 5.89 ERA (165.0 ip/108 er) over 34 appearances (32 starts). With Marlins, posted 8-8 record with 6.49 ERA (102.2/70) in 22 games (20 starts). In 12 starts with Baby Cakes, went 3-3 with 5.49 ERA (62.1/38)... Began campaign in Marlins' starting rotation, earning first win of season in first start, April 8 at Mets. Allowed one run on one hit and three walks, with six strikeouts, over 5.0 innings... Next outing came out of 'pen on April 13, as he was forced into relief in Marlins-Mets 16-inning game at Marlins Park. Pitched 16th inning and took loss after allowing game-winning home run to Travis d'Arnaud... Two nights later, came back and tossed then-season high of 6.0 innings on April 15 vs. Mets. Retired 15 consecutive batters from the second-sixth innings, marking a career-best. .. On April 21 at San Diego, tossed 6.0 innings again, allowing just one run and six hits while walking two and striking out five. .. Struggled over next three outings, allowing 18 earned runs and raising season ERA to 7.53 through May 8. Was optioned to NOLA following a start against the Cardinals on that date... Went 0-2 with a 5.93 ERA over his first three starts with the Baby Cakes, through the end of May. Then went 1-1 with a 7.03 ERA in six starts in June. Rebounded after that, posting a 2-0 record and 2.16 ERA in three starts in July... Recalled on July 18 and made start that night vs. Philadelphia. Over first three starts back in rotation, went 2-0 with 1.74 ERA (20.2/4)... Tossed at least 6.0 innings in each of those three starts. Completed 6.0 against Philadelphia, allowing just two runs, tossed 7.0 shutout innings at Texas on July 24, and on July 29 vs. Cincinnati, tossed season-high 7.2 innings. In first six starts of season, completed 6.0 innings just twice... Set new career high with 11 strikeouts in win at Mets on Aug. 20. In prior appearance, against the Giants on Aug. 14, did not strike out a batter over 6.1 innings. The last pitcher with more than 10 strikeouts immediately following a game in which he went at least 6.0 innings without one was the Cardinals' Joe Magrane, who had 11 in a three-hit shutout at Wrigley Field on June 22, 1990. -Elias...Wrapped up season by earning a win in relief on Sept. 29 vs. Atlanta (1.0 ip, hb), tying his single-season career high (also, 2016). It was first career relief win. In first full Major League season, went 8-6 with 3.85 ERA (133.1 ip/57 er) in 25 starts. Ranked second among Marlins' starters in ERA and third in innings pitched, wins and strikeouts (124)...Missed 29 games from August 15- September 25 with tendinitis in left third finger... Struggled in first start of season, April 7 at Washington, allowing two hits, three runs and two walks while striking out two in just 1.0 inning of work... In second start of season, recorded career-high nine strikeouts over 6.0 shutout innings, April 13 at Citi Field, allowing just four hits and a walk. Matched strikeout mark three other times (also June 1 vs. Pittsburgh, June 28 at Detroit, July 17 at St. Louis)... Combined to strike out 17 in two starts from April 13-19, which marked most strikeouts by a Marlins lefthanded starter in consecutive appearances since Dontrelle Willis struck out 18 from Sept. 10-15, 2006 (Stats LLC). Did so for second time from June 1-7... Earned first win after no-hitting Milwaukee over 7.2 frames on April 29 at Miller Park. Walked four and struck out seven... In research provided by Elias, Conley, who left game with 5-0 lead after throwing 116 pitches, was first pitcher in Major League history to be removed from a start with a lead after pitching at least 7.2 innings without allowing a hit. Previous alltime record had been established just three weeks before, when Dodgers rookie Ross Stripling pitched 7.1 hitless innings in his Major League debut on April 8 at San Francisco...Earned second win of season on May 5 vs. Arizona. Allowed two hits and a walk with six strikeouts in 5.1 innings. Did not allow a hit until fourth inning, running hitless innings streak to 11.1. Marked longest such streak by starter in Majors last season, and longest by any starter in Club history...Ranked as second-longest stretch overall, behind Armando Benitez's 14.0 hitless innings from May 4-June 4, 2004. In addition, tied Marlins' record for fewest hits allowed (2) in a two- start stretch, equaling accomplishment of Al Leiter in May 1996... Walked one batter or fewer in 10 of first 18 starts and 16 of first 29 career starts. Marked second-most such games by a Marlins starting pitcher through first 29 career starts, behind Brian Meadows (18). Finished season with 12 starts allowing no more than one walk, going 5- 2, 2.49 (68.2/19) in those outings...Struck out 37 batters across six starts in June, setting new career high for strikeouts in a month, surpassing 30 in September 2015... Tossed 6.0 scoreless innings on July 3 against Atlanta at Fort Bragg, N.C., to earn career-high fifth win. Allowed four hits and a walk with two strikeouts in Miami's 5-2 victory... Produced an 8.37 strikeouts/9 innings rate, which ranked second 94 on team, behind José Fernández (12.49), and 20th among NL starters. Split fifth professional season between Miami and Triple-A New Orleans, taking home Miami's Organizational Pitcher of the Year. Posted a combined 13-4 record to go with 3.00 ERA (174.0 ip/58 er)...Eclipsed professional highs in innings pitched, tossing combined 174.0 inning, while also setting a professional high with 140 strikeouts...With NOLA, went 9-3 with 2.52 ERA (107.0/30). Named to both midseason and postseason Pacific Coast All-Star teams, while also being named starter in PCL All-Star Game. Also named PCL Pitcher of the Week for June 29-July 5, and Marlins' Pitcher of the Month for June. Went 3-0 with 2.05 ERA (26.1/6) in five appearances (four starts) in June, holding opponents to .172 average with 19 strikeouts and nine walks...With New Orleans, won career-best five-straight games from May 26-July 5 while posting 1.42 ERA (44.1/7). Tossed season-high 7.1 innings on June 5 at Tacoma, allowing three runs on six hits and a walk with a season-high eight strikeouts...Did not qualify for ERA title, but held lowest ERA in Pacific Coast League at 2.52, while .219 opponents average also would have led league...Made three appearances on the big league roster: June 8-11, July 11 and August 1 through end of season...Finished campaign in Marlins starting rotation, posting a 4-1 record and 3.76 ERA in 15 games (11 starts). Among National League rookie starters with 10-or-more starts, ranked fourth in ERA (3.68), while strikeouts/9.0 innings ranked fourth (8.44)...Made Major League debut in first stint, tossing scoreless inning on June 10 at Toronto. Retired side in order with just six pitches...Limited opponents to three-or-fewer runs in each of last eight starts, going 3-1 with 2.78 ERA (45.1/14) in that span. Allowed two-or-less runs in final five starts to end season...Made first career start on July 11 vs. Cincinnati, earning win after limiting Reds to two runs and five hits (one home run) while walking two and striking out two in 5.0 innings...Recorded first career Major League hit in first plate appearance, August 6 at Atlanta. Stroked one-out single in fourth inning off Matt Wisler...Tied season high with four runs allowed on August 18 at Milwaukee. Surrendered four hits while recording six strikeouts over first three innings. In fourth frame, gave up four runs on five hits. The seven strikeouts marked a then-season best, eclipsing previous high of three in prior start...Held first-place Mets scoreless on three hits while walking none and striking out six over a career-best 7.0 innings on Sept. 16 at Citi Field...Led all NL rookie starting pitchers with 2.54 ERA in September, while ranking second in strikeouts (30) and third in opponents average (.219). Missed half of fourth professional season due to injury, appearing in just 12 games (11 starts) with Triple-A New Orleans, posting a 3-5 record and 6.00 ERA (60.0 IP/40 ER)...Made six starts prior to landing on seven-day disabled list with left elbow strain on May 4. Owned 2-2 record and 4.76 ERA (34.0/18) with 11 walks and 37 strikeouts prior to injury...Reinstated from DL and transferred to Class A Jupiter on June 17, allowing six runs (three earned) on nine hits and two walks in 5.1 innings vs. Palm Beach...Transferred back to NOLA and made five appearances before ending season on DL with strained left elbow. In five games, following return, went 1-3 with 7.62 ERA (26.0/22)...Tied career high with eight strikeouts on April 15 at Iowa. Matched that mark in next start on April 20 vs. Colorado Springs...Pitched 19.0 consecutive innings without allowing an earned run from the third inning on April 15 to the first inning on May 2...Went season-high 7.0 innings in back-to-back starts on April 20 vs. Colorado Springs and April 26 vs. Omaha...Made lone relief appearance of season on July 13 vs. Memphis. Allowed two runs on three hits (one home run) in 3.0 innings. 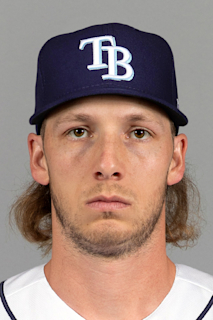 Spent entire season with Double-A Jacksonville, posting an 11-7 record and 3.25 ERA (138.2 IP/50 ER), along with three complete games, in 26 games (25 starts)...Led Suns in wins, starts, complete games, innings pitched and strikeouts (129). Led Marlins' farmhands in wins and complete games, ranked second in strikeouts and seventh in ERA...Tied for Southern League lead in complete games, tied for second in wins, ranked third in WHIP (1.17) and fifth in strikeouts...Among Southern League starters, ranked second in fewest baserunners/9.0 (11.03), third in strikeouts/9.0 (8.42) and fifth in walks/9.0 (2.41)...Named to Southern League Midseason All-Star team after going 8-4 with a 3.66 ERA (93.1/38) in 18 first-half appearances....Went 7-2 with a 4.00 ERA (72.0 IP/32 ER) over first 14 starts of season, allowing three-or-more earned runs three times. Despite a 4-5 record in final 12 appearances, owned three complete games and a 2.43 ERA (66.2/18), allowing two-or-fewer runs in all but two outings...Lone relief appearance came on July 5 at Charlotte. Took loss after allowing just one run on three hits over 4.0 innings...Tossed first career complete game on July 1 vs. Pensacola in rain-shortened contest (5.1 IP). Threw second complete game on July 14 vs. Mobile, a three-hit 7.0-inning shutout. On August 19 at Chattanooga, recorded third complete game (6.0 IP)...Went 6.0-or-more innings in 10 of 25 starts. Season high of 7.2 innings came on August 25 at Montgomery, when he allowed two runs on three hits...Held opponents to .213 average (27x127) with runners in scoring position, and just a .196 average (11x56) with RISP and two outs. Earned South Atlantic League Midseason All-Star honors with 7-3 record and 2.78 ERA (74.1/23) in first half of 2012. May 18, 2018 Miami Marlins recalled LHP Adam Conley from New Orleans Baby Cakes. March 16, 2018 Miami Marlins optioned LHP Adam Conley to New Orleans Baby Cakes. July 18, 2017 Miami Marlins recalled Adam Conley from New Orleans Baby Cakes. May 9, 2017 Miami Marlins optioned LHP Adam Conley to New Orleans Baby Cakes. September 26, 2016 Adam Conley roster status changed by Miami Marlins. August 14, 2016 Miami Marlins placed LHP Adam Conley on the 15-day disabled list. Left third-finger tendonitis. August 1, 2015 Miami Marlins recalled LHP Adam Conley from New Orleans Zephyrs. July 12, 2015 Miami Marlins optioned LHP Adam Conley to New Orleans Zephyrs. July 11, 2015 Miami Marlins recalled Adam Conley from New Orleans Zephyrs. June 12, 2015 Miami Marlins optioned LHP Adam Conley to New Orleans Zephyrs. June 8, 2015 Miami Marlins recalled Adam Conley from New Orleans Zephyrs. March 17, 2015 Miami Marlins optioned LHP Adam Conley to New Orleans Zephyrs. November 20, 2014 Miami Marlins selected the contract of Adam Conley from New Orleans Zephyrs. September 18, 2014 New Orleans Zephyrs activated LHP Adam Conley from the 7-day disabled list. June 22, 2014 LHP Adam Conley assigned to New Orleans Zephyrs from Jupiter Hammerheads. June 17, 2014 LHP Adam Conley assigned to Jupiter Hammerheads from New Orleans Zephyrs. May 6, 2014 New Orleans Zephyrs placed LHP Adam Conley on the 7-day disabled list. April 1, 2014 LHP Adam Conley assigned to New Orleans Zephyrs from Jacksonville Suns. January 9, 2014 Miami Marlins invited non-roster LHP Adam Conley to spring training. April 4, 2013 LHP Adam Conley assigned to Jacksonville Suns from Jupiter Hammerheads. January 28, 2013 Miami Marlins invited non-roster LHP Adam Conley to spring training. June 24, 2012 Adam Conley assigned to Jupiter Hammerheads from Greensboro Grasshoppers. April 5, 2012 Adam Conley assigned to Greensboro Grasshoppers from GCL Marlins. August 16, 2011 Adam Conley assigned to GCL Marlins from Florida Marlins. August 15, 2011 Florida Marlins signed LHP Adam Conley.